A gray California winter helps establish the pecking order among German sports cars. In the winter of 1846, a group of pioneers seeking a better life in the vast unknown of the American West got trapped by weather in the mountains of the California territory. Bored and running desperately low on cheesy Pringles, they had to turn to the most cursed of sustenance: putrefied beef jerky from the Sherman Oaks Chevron station. Did we say 1846? We meant 2018. And it’s cool; only one of our three pouches of Oberto had turned gray. Still, though, we didn’t know that could happen to beef jerky. All-wheel drive might make for hellacious launches, but it doesn’t help the car turn or stop when you drive into freezing rain on summer tires. We’d fled subzero temperatures in Michigan to conduct this comparison test in the fair Southern California weather, only to arrive just in time for the area to get its first precipitation of consequence in many months. For two straight days it rained and snowed, but finally the weather cleared and we could really crank up our Conestogas. Audi’s TT RS is new for 2018 and powered by a 400-hp turbocharged 2.5-liter inline-five. Compared with lesser TTs, the RS gets a front fascia with larger intakes that flare out for more airflow, a purposeful wing and large-caliber oval exhaust outlets in back, and a price that starts at $65,875. Our example’s options list was a lengthy one, but nearly all of it mattered. The $6000 Dynamic Plus package nets carbon-ceramic front brake discs and the stiffer Sport suspension; the $3500 Technology package adds navigation and a Bang & Olufsen sound system. The $1750 Black Optic package grants the roly-poly TT some menace by blacking out the exterior trim and mirror caps, and the $1000 exhaust system matches that with black tips and a loud button. All told, our Audi TT RS tallied $80,200. That’s very nearly as expensive as the Porsche 718 Cayman S it’s up against. Having forsaken the flat-six that was so central to its identity, the Cayman is powered by a turbocharged flat-four as of 2016. In the S, as in the TT RS, it’s a 2.5-liter, this one rated at 350 horsepower. Prices start at $67,350, but in typical Porsche fashion, the Cayman we tested stretched somewhat spendier. Notable additions include the Sport exhaust with a loud mode to match the Audi’s for $2890; the adaptive PASM Sport suspension that lowers the car 0.8 inch and stiffens the springs and anti-roll bars for $2070; 20-inch wheels for $1580; and a limited-slip differential with brake-based torque vectoring for $1320. And then there’s another $6380 in rinky-dink tier-two nonsense to inflate the final sticker to $81,590. The Cayman holds the distinction of having earned a spot on our 10Best list every year it’s been available, so it’s fair to say we like it. But it’s also fair to consider this TT a coupe version of the RS3, which joined that list this year. Should be a good fight. Wagons ho! It’s a high-style way to navigate the mountains, but the TT RS is no prima donna. With 354 pound-feet of torque at 1700 rpm and all-wheel drive, this red-orange nugget launches like a magma loogie. Launch control revs the five-pot to 3500 rpm and then dumps the clutch, so that the TT RS blows past 60 mph in just 3.2 seconds. The apogee of car cuteness until Pixar got into the game, the TT has turned nasty, running 11.6-second quarter-miles at 119 mph. The nicest sports-car interior for less than $150,000, the last five-cylinder that matters. Covered-wagon ride nets only moderately impressive handling, overly sanitized soundtrack. A lovely and impressive thing that keeps the driver at a distance. Audi’s little coupe has no match when it comes to interior styling. It’s fastidiously detailed, with hardly a contour change or line break that isn’t set off with a new material or finish. Just look at the seats—black leather with red contrast stitching around diamond-patterned perforations, each of which allows a peek at the red underside of the seating surface. Even the seatbelts have red bands along their edges (part of the $900 RS Design package). Audi incorporates all of this without making the TT look fussy or overly busy, and the in-dash air vents seem to have benefited from as much engineering as the entire Dodge Dart. Perhaps it’s the back seat—strictly for kids—but the Audi’s interior feels more spacious than the Porsche’s. That said, it’s in the Audi that tall drivers will find their heads jackhammering the headliner on rough roads. That Sport suspension swaps in stiffer fixed-rate dampers for the standard adjustable units. Technical director Eric Tingwall noted: “The short suspension travel, stiff compression, and loose rebound control mean this car can feel both harsh and springy—often in the same suspension event.” It’s fine on smooth pavement and for commuter duty, but on rough roads, you get the impression that the suspension is taking each input, then magnifying it and propelling the body upward with two times the force. And despite that, the Audi can’t match the Porsche’s feel or feedback. The lack of body movement and dearth of steering feel make it hard to tell when the Audi is at its limits. You end up driving the car not quite certain how close you are to the edge of control, which is particularly unnerving in the wet. The TT RS is an accomplishment, a dramatic departure from what the TT had been, and an impressive car. 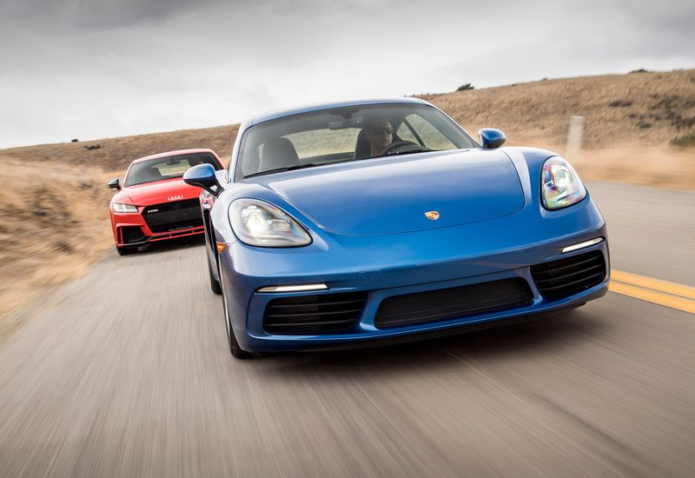 It’s just a little too narrowly focused, a little too compromised, to beat the Cayman. Then again, the Cayman is very nearly a perfect sports car. Chassis dynamics perfected, with the world’s best transmission to boot. As loud inside as an Airbus with a leaky emergency exit, extortionist options pricing. One of the best cars at any price is hard to beat, especially on an even playing field. Whereas the Audi’s ride tends toward punishing, the Cayman’s has some baked-in compliance that helps communicate loads and forces to the driver. But don’t mistake softness for weakness: While the TT RS nipped the Cayman by 0.01 g around the skidpad, the Porsche outpaced the Audi in the most critical dynamic evaluation, our unequally spaced slalom that combines acceleration, deceleration, and cornering. The Cayman’s steering weight increases predictably to let you know how close to the limit you are, and the low hoodline afforded by the mid-mounted engine is a boon for forward visibility that makes placing the Porsche on the road a cinch. In the Audi, the uniform radius of the bulbous nose hides the corners of the car pretty effectively. If you wanted to read anything into the placement of controls on steering wheels, it might be that the Porsche is more driving focused. The Porsche scrapes and scratches its low, low chin on driveway transitions, but it’s the car that we wanted for those long, rainy highway slogs. Even with its suspension set to maximum firmness, the Porsche still has a comfier ride than the Audi. There is a downside to the Porsche on the highway, though. It’s loud. The flat-four is more vocal than the Audi’s five under all conditions, but at highway speeds, it turns 1000 rpm or so higher. Geared tall on the low end—redline arrives at 47 mph in first and 80 in second—and short on the high, it’s as though the Cayman has six third and fourth gears. And there’s enough road noise to make you think that at least 174 of the Audi’s 175 extra pounds are sound deadening. Porsche can’t blame it on tires, as both cars rode on Pirelli P Zeros. It doesn’t help matters that the Audi’s Bang & Olufsen is an outstanding stereo, and the Cayman’s base system sounds not entirely unlike an iPhone in a Solo cup. We also find it a little bit insulting that you can spend $80K on a Porsche and still not have automatic climate control. That’s embarrassing, not so much for owners as it is for Porsche. But speaking of sounds, oh, the Porsche’s. Rest in peace, flat-six, and long live the turbo four! The more time we spend with 718s—and the further into memory that six’s wail fades—the more we like the four. This thing sounds like a goblin, all mechanical grumble and spitting overrun. There’s even a little aural treat when you turn the car off and the four grumpily clatters into silence as though not all its parts stop moving at the same time. Needing 14.5 psi of boost to generate full power—the TT RS swallows 19.6—the Cayman can be laggy at low rpm around town, which is never a problem with the Audi. But during exercises on roads that keep the revs up, there’s nothing to worry about. Being a manual rear-driver, the Porsche was slower than the Audi in acceleration testing—4.1 seconds to 60 mph, 12.4 and 115 mph in the quarter—but being a manual, it’s also vastly more engaging. And this isn’t just the better transmission in this test; Porsche manuals are the best transmissions you can buy today, period. Shifter throws are direct and tight, and the clutch’s weight and progressive takeup put on a clinic other manufacturers should attend. Few things in life illuminate the joy of using a well-designed product for its intended purpose quite like rowing a manual Porsche down a winding road. Not even blasting a quicker, more powerful Audi down that road. It was enough to make us forget the rancid beef jerky. *The first ratio is for gears 1, 4, and 5. The second is for 2, 3, 6, and 7. * These objective scores are calculated from the vehicle’s dimensions, capacities, rebates and extras, and/or test results.